“New Year, New You:” Oh really now? What has changed? So, it’s day seven of the New Year…how are these New Year’s Resolutions holding up? Is the passion still there? Has doubt come to reclaim its position of authority in your life? Have there been any successes? Any significant milestones? Well, this has been my story for oh so many years, which is why I’ve stopped the whole New Year’s Resolution thing altogether. 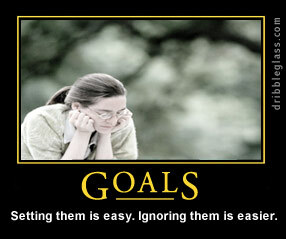 I’ve decided to set goals, measurable ones, so that I can track my progress and tweak my methodology if I need to. I don’t really need a special day to set my goals; I set them when they come to me, and after contemplation and meditation over WHY I want this particular thing in the first place. And that’s why I’ve decided to chime in on this topic seven days AFTER New Year’s: to refocus the distracted, to encourage the doubtful, and to offer viable tips on how to properly set goals and intentions. www.WingsForTheHeart.com offers phenomenal advice in an article about staying focused on your goals. In the article’s 5-step instructional, step two is one of the most important goal-setting imperatives. The article recommends that you do a self-inventory to assess, with clarity, why you want a particular goal. The author writes “﻿the subconscious mind can be sneaky with the messages it sends us, and we might think we want something, when in fact we really want something else entirely” (Wings for The Heart, n.d.). The article then goes on to suggest that when setting goals, it is important to continuously ask yourself WHY you want something, until you’ve come to the most simplest intention behind your goal, the reason you really desire to achieve a particular thing. When people say they want to lose weight, for instance, many times the deeper motivation is to feel better about themselves. Wings for the Heart recommends that we trace the origin our truest motivation so that we can find significant meaning for our goals, keep them close to our hearts, and be able to focus on them until they are achieved. Another one of the most important practices in setting and staying focused on your goals requires visiON, viSION, and MORE VISION! www.BusinessKnowHow.com suggests that you “‘See’ your objective already in existence” (Angier, 2000). Angier goes on to state that “[your goal] will operate like a magnet and draw forth all kinds of things you never thought possible” (Angier, 2000), so stop over-thinking, is what I’ll add. Stop thinking that the attainment of your goals can’t be possible because of your immediate circumstances, and the fact that you did something you weren’t supposed to do last year, or the year before that, or because you grew up in poverty, and are a minority, or a single parent, or a high school dropout, or WHATEVER! Stop thinking that there is no way the universe will favor little ol’ you and your little ol’ goal. If this is your inner dialogue, then create someone else to talk to, find yourself a new homie. Period. Set your goals, and envision yourself reclined in the front seat of that new Mercedes CLS 550 that you want, or see yourself holding that college degree and walking across that stage. Picture the big old smile you’ll have on your face when you are moving your furniture in your brand new mortgaged home. If you need some assistance, create a vision board and add to it clips of all the things you desire to achieve in the short-term, mid-term, and long-term. When things aren’t going too well, call forth the visions of your desired future. Do this until you reach your desired goal, and then set new goals, and start this process all over again! I’ll be taking this advice as well (because of course, I need it, too), and expect us all to obtain everything our hearts desire!!! Why not? Canfield, J., Hansen, M. V., and Hewitt, L. (2001). Power of focus: how to hit your business, personal, and financial targets with absolute certainty. Florida: Health Communications. This entry was posted in Goals and Ambition, Mental Health Facts and tagged Goal setting, Law of Attraction, Motivation, New Year, New Year Resolutions, Staying focused, vision boards. Bookmark the permalink. Can I just say what a relief to find someone who almost always knows what they’re talking about on the internet. You definitely know how to bring an issue to light and make it central. More people need to read this and understand this side of the story. I cant believe youre not more popular because you definitely have the gift. I am doing a little research and “stumbled” upon your site. Thank you! Thank you for reaching forward. Surely we all sharing this experience of life. Best wishes as you complete grad school. Well hello, Lei-Ann! I’m glad you stumbled on over here! *big hug* Thank you so much for the kind words. I hope to provide you and others with insightful information in the near future. So many people have done the same for me! !